Some people believe that critical thinking hinders creativity because it requires following the rules of logic and rationality, but creativity might require breaking rules. This is a misconception. Critical thinking is quite compatible with thinking "out-of-the-box", challenging consensus and pursuing less popular approaches. If anything, critical thinking is an essential part of creativity because we need critical thinking to evaluate and improve our creative ideas. Critical thinking is a domain-general thinking skill. The ability to think clearly and rationally is important whatever we choose to do. If you work in education, research, finance, management or the legal profession, then critical thinking is obviously important. But critical thinking skills are not restricted to a particular subject area. Being able to think well and solve problems systematically is an asset for any career. The Fourth Industrial Revolution, which includes developments in previously disjointed fields such as artificial intelligence and machine-learning, robotics, nanotechnology, 3-D printing, and genetics and biotechnology, will cause widespread disruption not only to business models but also to labour markets over the next five years, with enormous change predicted in the skill sets needed to thrive in the new landscape. 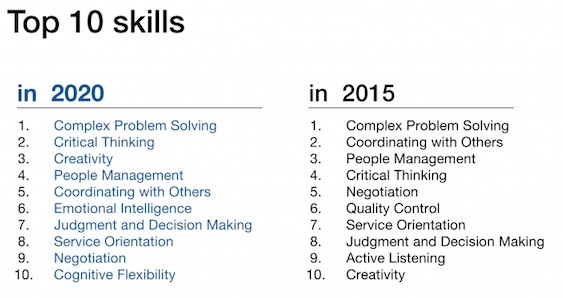 The top three skills that supposed to be most relevant are thinking skills related to critical thinking, creativity, and their practical application. These are the cognitive skills that our website focuses on. The ideas on this page were discussed in a blog post on edutopia. The author uses the critical thinking framework here to apply to K-12 education. Very relevant to school teachers!